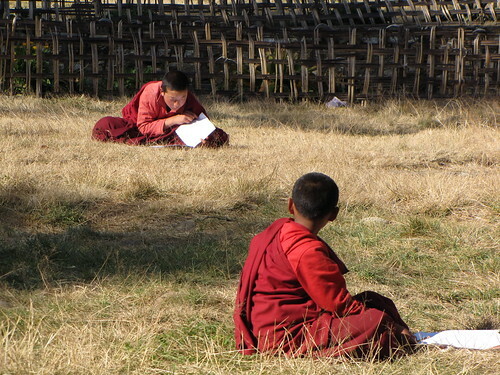 green tea: Bhutan: what do monks do? 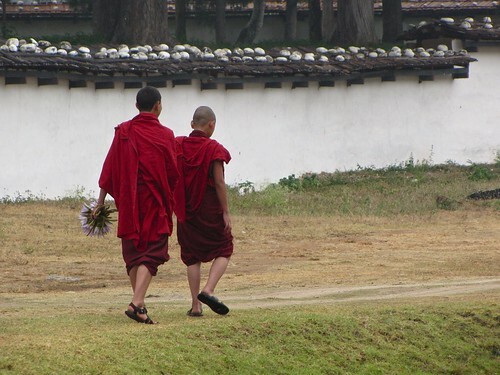 Bhutan: what do monks do? 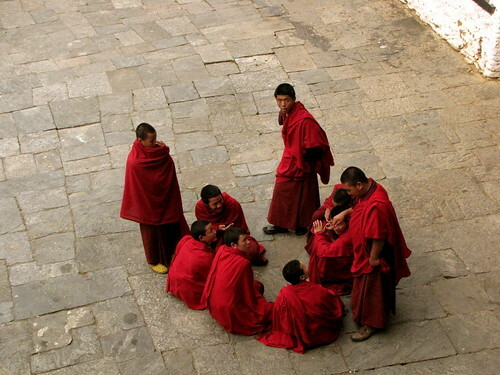 In Bhutan, you encounter monks at every turn. They join the crowds in markets, sit patiently on the sidelines of archery matches, roam narrow trails on the sides of ridges, stuff themselves into Toyota Land Cruisers, and, in the case of the highest monks of all, sit alongside the king in photographs hanging on walls. In Bhutan, some monks are paid by the government, while others are supported solely by private donations. 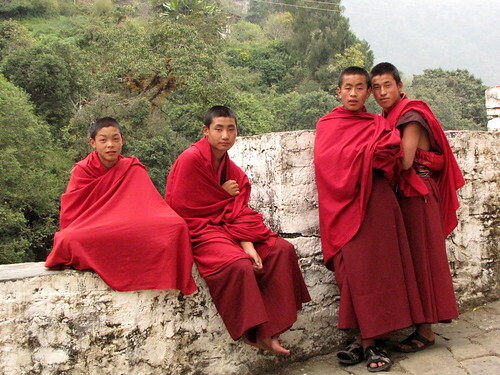 Most monks in Bhutan are men, but there are a handful of nuns called anims. These men (and a few women) deliver a range of spiritual services that may startle the Western mind. Their competencies span the territory between earthy and elemental to unspeakably abstract and everything in between. Even the first-time visitor to Bhutan will see monks doing unexpected things. For example, monks dance, paint art on the walls of temples, play music on human thighbones, and spend the entire night sitting on stone floors, chanting prayers. In addition, Buddhist professionals are expected to know whether a proposed action is auspicious or not. They unearth the answer through a process known as divination. If we used elapsed hours as the measuring stick for monk services, then surrogate praying will probably come out on top. Bhutanese rely on the professionals to say prayers for the people and their families. Lay-people can say prayers to a certain extent, and many of them fervently pray every morning. But serious, sustained prayers cannot be said by the people themselves. Only the professionals know the requisite language and ritual. PS: All the portraits were taken with permission from the monks. These are truly wonderful photos - you have a very good eye and sense of timing. Loved the photos on your blog. 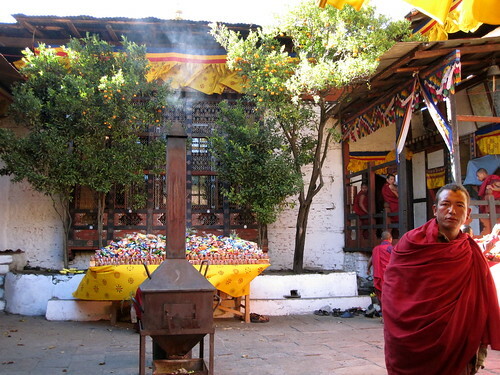 I'm planning a trip to Bhutan during Fall & am very inspired by your experience. What make is your camera? Thanks, you are both very kind! My camera is a Canon PowerShot SX10 IS. It is NOT a DSLR, but it has a superzoom lens. That's a 20x optical zoom. This powerful zoom is ideal for Bhutan's big spaces and distant views. I still dream of a DSLR for better portraits and detail photos. However, I should really learn more about how to get better results from the equipment I already have.